Move over minimalism, it’s time to welcome back bold patterns. From simple polka dots to whimsical animal motifs, this season sees the return of graphic prints to menswear, with both high fashion and the high street carrying the trend. Regardless of whether you’re used to wearing statement designs or are more of a clean-cut kind of guy, it’s never been easier to work a dash of pattern into your everyday wardrobe. Check our out top printed picks for the season, from attention-grabbing shirts to more subtle accessories. OK, so this backpack isn’t the most affordable option on the market, but if you’re a fan of Parisian brand Kenzo, you’ll view it as a collectable. 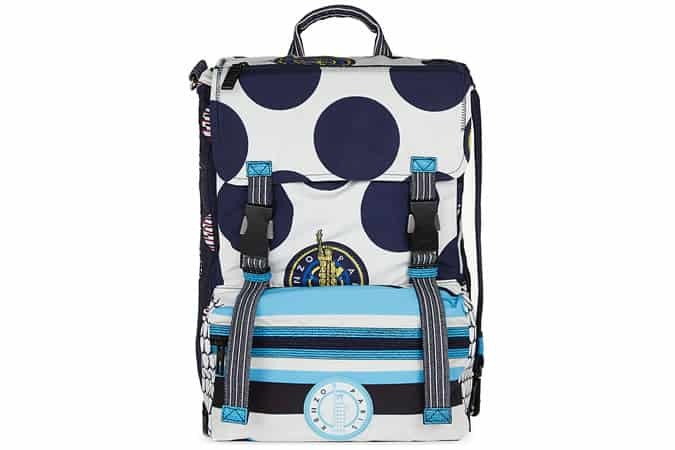 With adjustable shoulder straps, capacity adjuster zips, a secure fold-over flap with zipped pocket, and snap-fit buckles, the French label combines utilitarian features with its signature playful approach to prints, making it as practical as it is eye-catching. Available at Selfridges, priced £455. Continuing the polka dot theme is this blue Grettel shirt from Ted Baker. Despite hosting a large scale print, the soft colours and pop art effect transform this shirt into a perfectly understated piece that will work within any formal look. Keep your tailoring lightweight and pared-back for a subtle finish. Available at Ted Baker, priced £95. We’re big fans of Converse’s ongoing collaboration with Italian fashion house Missoni, with its latest collection throwing up a vast selection of covetable printed pieces. These unisex hi-tops incorporate a striking basket weave effect, with the metal eyelets and thin laces adding a luxurious finish. Available at Office, priced £64.99. While there’s still a slight chill in the air, we’re very tempted by this waterproof jacket from Ark Air. The sharp geometric print gives off a futuristic vibe, while the muted palette of grey, green and white adds a military-inspired ruggedness. Keeping warm and dry never looked so good. Available at Present London, priced £270. Known for his unorthodox design approach, J.W. Anderson has treated us to some striking graphics this season. Interpreting the works of textile artist John Allen, the designer has transformed the humble white tee into something extra special. Available at Selfridges, priced £155. Whether you’re an aviation enthusiast or not, we guarantee this plane printed tie will put a smile on your face. Crafted from authentic vintage silk, we love the whimsical motif that adorns this accessory – perfect for adding a playful, retro touch to your standard dress-down Friday get-up. How could we talk about prints without giving Orlebar Brown a mention? Its now infamous bulldog shorts come in a range of stunning photographic prints, each making us want to hop on a plane to somewhere hot right now. This beach scene printed pair are ideal for wearing poolside, teamed with a classic white tee. Available at Orlebar Brown, priced £225. Forget bland accessories – Richard James is bringing a touch of class to the standard pocket square with this antique map printed iteration. Made in Italy from smooth silk, not only can you expect the finest quality, but an intricate print that you won’t see anywhere else. Another print veteran – London department store Liberty – has made our countdown, with its perfect for spring Freya shirt. Utilising one of the brand’s signature floral prints, the retailer has added a touch of British heritage to the modern short-sleeved silhouette. We’d wear this with denim shorts for a cool, comfortable daytime look. Available at Liberty, priced £120. Check prints dominated the AW14 runways, and this lightweight J.Crew scarf offers an easy way to keep the trend going into the next season. Demanding attention in a refined way, working this piece into your wardrobe is an easy task, plus the soft cashmere fabric feels as good as it looks. Available at Mr Porter, priced £110.